For thin matchstick fries like the ones I made, use two 8x8 inch square pans. For a little thicker fries, you can use a 9x12 inch pan. Line the pan or pans with parchment paper, letting the ends extend over the sides of the pan so you can easily lift the chilled dough out for cutting. Whisk together the flour, salt, pepper, and spices. Heat the water and oil to boiling in a saucepan. Turn down the heat and slowly whisk in the chickpea flour, stir until it thickens and is smooth, about a minute. It will look like a thick oatmeal. Spread the mixture in the pan, smoothing it with a spatula. Take another piece of parchment and lay it over the top and continue to smooth it out as evenly as possible. Refrigerate for at least an hour until fully set. It will set up just like polenta. Meanwhile make the dipping sauce by whisking all the ingredients together in a small bowl. Chill till needed. If you like a thinner sauce you can whisk in a little water. When the dough is completely chilled, carefully lift it out of the pan and cut into 1/4 x 4 inch strips for matchstick style, and 1/2 x 4 inch for thicker style. Heat about 1/2 inch of oil in a large skillet till it reaches 350-360F. Be patient, this takes a few minutes, and you want the oil to be hot enough to crisp the fries and not soak into them. 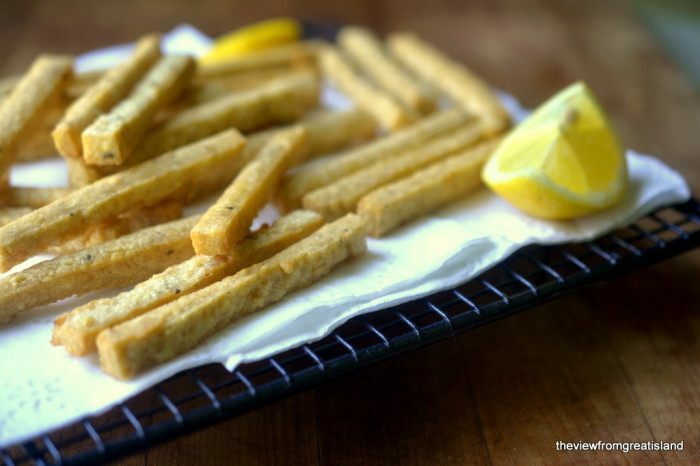 Fry the chickpea strips in batches, if the oil is the right temperature they should be golden in 2 minutes. Season with a little fresh ground sea salt, dust with parsley and serve right away.